No smell of diesel, no noise, no shaking from the engines. Passengers commuting to Luleå city centre from the suburbs of Kronan or Porön on board one of the five brand new electric busses will have a comfortable ride, the municipality reports. Maiden drive with big festivities was on Saturday, while regular scheduled traffic starts Monday morning. Chargers for the busses are placed in both ends of the route. Charging takes some 5-7 minutes and gives the bus a range of about 50 kilometers. The electricity for charging the batteries comes from 100% renewable hydropower and wind-power produced in northern Sweden. Each bus has seating for 47 passengers who can enjoy WiFi and chargers for mobile devices in each seat. The electric city busses project is a cooperation between the municipality of Luleå, the local energy company and the city’s bus company LLT. 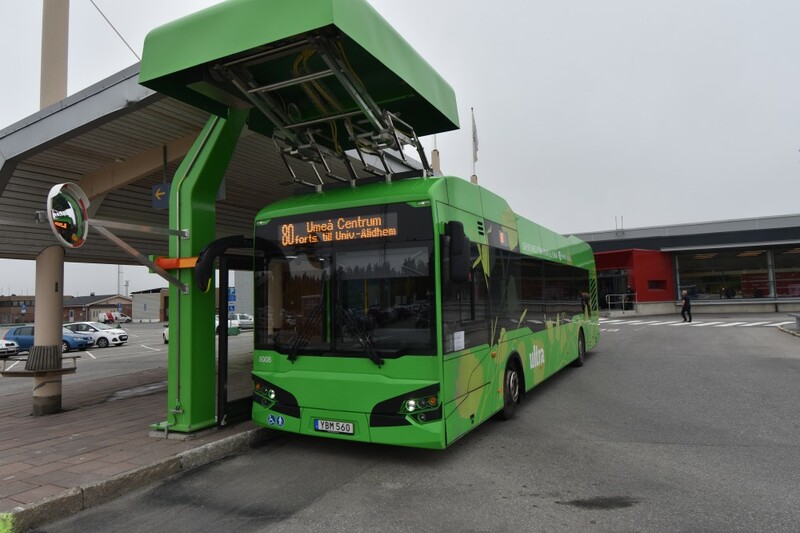 Electric bus traffic has already proved success in another northern Swedish city, Umeå, were 12 green-colored battery busses serve routes within the city. Located just 100 kilometers south of the Arctic Circle, Luleå is now the world’s northernmost city with battery powered city busses. Murmansk, though, has the world’s northernmost electric busses, with a comprehensive network of trolleybusses driving the streets of the northern Russian city since 1962.